Does anyone know of a supplier(s) that offers labeled color wiring by the foot? I have been searching for companies that sell labeled automotive wiring by the foot so I can compare prices and availability. I will have to build my own wiring harnesses for this project. One for the dash. One for the coach and one for the engine compartment. I believe I finally came up with a Headlight circuit that I am comfortable with using when it is time to rewire UV231 Project. This setup will have very little amperage going through the actual headlight / turn signal switch itself. This type of setup, as an upgrade, can be found on older vehicles with small gauge wires and/or very expensive, hard to find, replacement headlight switches; to help prevent the need for replacing them again. See the attached diagram. Again I will be going with LED lights all around. However, I try to plan for all possibilities and this setup is designed so that the new owner (of UV231) can switch to Halogen headlights if they so desire without the need to rewire or upgrade the headlight system. My plan is that the Relay Panel will be a flip down panel located under the middle of coffee bar for easy access troubleshooting and/or to replace a relay. It will also make the wire runs to each headlight easier with shorter runs of the same length. NOTE: My setup will be using a newer style headlight switch; where the headlight switch and dimmer switch are all in one, located on the steering column. I will be doing the same type of setup for the turn signals so hopefully the headlight / turn signal switch will never need to be replaced due to it wearing out the contacts. If you have any questions or if you notice something that I have overlooked - please let me know. Every now and then a fire is lit under me to see if I can find a cost effective way to have new headlight bezels made. This has been going on for a few years now. When it happens I do all I can to find someone to make them. Don't get me wrong. I have found a couple of places over the years that were willing to make them. However, 1. any of the ones I have to send them are not in the best of shape to use to make a good mold. 2. they say the new ones will be slightly smaller in diameter than the original one and 3. the quotes so far have been way too high that I would not be able to offer them to other Ultravan owners to help keep their coaches looking original. The cost for the 6 sets I currently need would be $4,800 before chrome plating. Recently I was watching a video and got some information about another foundry and a different way to make the bezels. I made some calls the other day and I am waiting to hear back from them. Fingers crossed (as my mother would say) I hope to have good news. 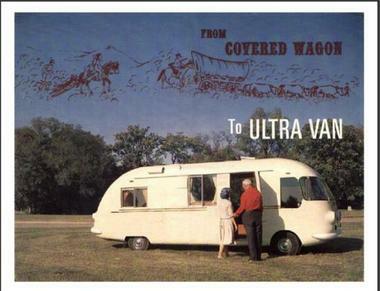 If not, I will keep trying in hopes that one day I will be able to replace the badly damaged and/or missing ones on our collection of Ultravans, not to mention be able to offer them to other Ultravan owners too. March 20, 2017 Posted on Ultravan Build Project Facebook page. I understand one does not have to have a JIG when making a single set (pair) of control arms. However, I have viewed a lot of online videos and talked to a couple of shops who make front suspension components. To help ensure better front suspension alignment when the new control arms have been installed; I strongly feel it is BETTER to have a JIG to help ensure that no single piece shifts or that any one arm is welded slightly off from (it's bother or sister) on the other side. With that said and because I have more than one coach to work on I have pulled the trigger (invested) into having a two sided JIG made for my new steel lower control arms. The JIG will keep everything in place while it is being welded on one side. Then they remove all the securing points and flip the arm over by its pivot points. Then they secure it back down again and finish welding the other side before removing it from the JIG. This will ensure that every set (pair) are made the same. FYI - A complete set of steel lower control arms, ready to bolt on, with new bushings and ball-joint sleeves is costing me around $1,000US per set or pair. The JIG is setting me back another $550US. But I feel it is well worth the peace of mind and insurance. For sometime now I have had an idea in my head for a wire rack design to help me when it is time to rewire UV231 Project. I don't think such a wire rack would be needed if: you had only one vehicle to do or if you plan to lay everything out on the floor or a table. But I feel it would work well when it came time to feeding the individual wires through a 22 foot long Ultravan or you had more than one to do. If at all possible I like an item / tool to be able to do two or more things. So my design is such that on one side of the wire rack it will have large spools (1,000ft and up) of labeled color wire and on the other side it will have smaller spools (500ft or smaller) for those circuits that are kept to one area and can be made on a table, then installed in the vehicle. I will try to remember to post a picture of it when it is finished and being put to the test. Thanks for sharing your updates. It helps to inspire. Sometimes life can delay our projects. I know I said it before. But whenever that happens to me I still try to move the current project forward by doing anything I can. Research and planning are just some things I do. Not too long ago you may recall that I posted my design for a new headlight circuit to be used on UV231 project. I also plan to use the same setup on our other Ultravans. In November my plan is to start production of a new headlight wiring harness kit. It will be available to other Ultravan owners as a plug-in-pay kit. This kit will come in two options; with or without new switches. IMHO, It is one of the weaker links in the Ultravan wiring. The gauge of the wires are too small, too long and the supply of power is too far away. Not to mention an unnecessary heavy load on the switches. Ultravan owners may have noticed dime headlights. Some have chosen to switch to LED headlights and not upgrade the wiring circuit. I however, plan to not only upgrade that circuit. My design will handle any kind of headlights; providing more choices to an Ultravan owner, while providing a full 12 volts supply to the headlights. First thing this morning, I went back and started looking at some of my options to use for my storyboard. What I decided to use was white pegboard in a 4x8 sheet. I hope t buy one if not two sheets soon along with some needed supplies. In the future I picture hanging each storyboard (when not in use) from the rafters in my new garage. I will use a portable table on wheels to roll under that area to then lower the storyboard I need to use down onto the table. When not in use it will hang back up. I first want to thank everyone who was interested in my project. I hope I was helpful, that I encouraged you, and what I posted helped someone out there. Helped to keep you motivated and focused on your own project. This is more than likely going to be my last post here on my Facebook - Ultravan Build Project page. On January 2016, I joined Facebook for one reason and one reason only. To share my hobby, document my current project (build process) step by step and to help others if and when I could; with my years of mechanical experience as an ASE and US Army mechanic along with what I learned as a business owner before I retired in 2000.. It is free and the best part about this site is that you can following along from start to finish, in order, as the process unfolds. I hope you still come along for the ride and enjoy it along the way! Since Sept 20th I have purchase a used light meter to do a before and after test of the how strong the lights are before and after the new wiring and fuse panels. I also went to Home Depot and checked out the white pegboard to make sure it is something I want to use and I got the price for a 4'X8' sheet while I was there. From time to time since then, I have been working on a new layout for the entire wiring and new fuse panels. I have changed my mind more times than I can count. But I have always felt it is best to change your mind on paper and not in the middle of a given project. Even though that too can happen. It has also been nice to share this process with others. To bounce ideas round and get good feed back. It helps you see things in a different light and so you don't miss something. It can provide you other ways of doing something. That way you can take the best of all of the ideas and still make it your own. Each time I have had free time, to go back, to pick up the pegboard - it has been raining. I plan to get the pegboard soon. Thank you for your interest and checking in. Yesterday I was finally able to pick up the White peg board I wanted and get it home without it getting wet. The store is over an hour away and I did not want to ruin the peg board by it getting wet coming home. I decided to use it for my story board, to lay everything out and be able to use it, again and again, any time I need another Headlight harness. While I was at Home Depot I also grabbed; #10-24X2" long screws, flat washers, and nuts in packs of 100 for a lot less than those little packs of 6 - 10 and 14 pieces. Not that I will need all 100 screws. But 3 packs of 14 screws would have cost almost $3 dollar more than the 100 pack of the same size screw. So why not go with the 100 pack. Anyways, I have picked out the heat gun I plan to buy and other items that I will need. I also have to order the label wires when I'm ready. I will be working on this in the formal dining room over winter. Lots of light and it will be warmer than the garage or basement. I will be offering a basic Headlight wiring harness kit soon and I hope to have a deluxe kit available shortly there after. Pictures and more info to come, when available. My neighbor was kind enough to come over and help me place the plywood and peg board on our dining room table. I put an old painter's cloth on the table first to protect it. Then the plywood on top of the painter's cloth to keep the head of the screws, which will be on the back side of the peg board, from damaging the table. Now I'm working on the design of the layout to make the story board. Once I have it finished I will post a picture. Its been a little while since my last post. So far I have found suppliers for almost everything I need to build the new headlight wiring harness. Marie and I happen to be blessed as caretakers of a few Ultravans, that I hope to restore some day. It is also one of the reasons why I am going to the trouble to make this wiring harness in a kit form. I also enjoy helping others when I know that I have something to offer. So I plan to offer this harness as a kit, along with the other wiring kits that I came up with due to the need to rewire UV231 project. But I am having a hard time finding a place that can label 8ga wire every 6 inches or so. The one place I did find so far, labels 1,000 feet or more and I only need 100 to 200 feet. Oh, I also would prefer to use brass Packard 59 terminals that are not plated. However, it seems that the 10-12ga terminal only comes in a plated style. Why am I going to all the trouble to have each wire labeled every 6 inches or so? 1. I personally have a hard time making out with some colors and I don't think I'm the only one. Have them all labeled will make it easier. 2. I have always wanted to find a good home for UV231 and I don't want to make it any more difficult for someone to trace an electrical problem(s) in the future, should something come up. 3. If it is worth doing - It is worth doing right! More to come as it unfolds. I gotta get mine running it's sad how close it is, but not being worked on. Forward progress with the results of the latest Computational Fluid Dynamic testing on UV548, our "road worthy" Olds 455 Toronado coach. But it's all helpful, and more so for the hydraulic cooling system I have been working on. Years ago, I thought the best and only way to help cool these overheating Ultravans was with a hydraulic cooling fan system. YES - I could throw money and time at it and get it to work. Maybe even the first time out the gate. But my choice is to move forward with proper data and "hopefully" only build it once and I would like it to work the best it possibly can. Not just getting by... The time invested and these test will surely help. It's also a learning experience. Thank you for your interest in my project and for stopping by. All the best with your project(s).